If, Bwana is the performance name for experimental music legend Al Margolis. 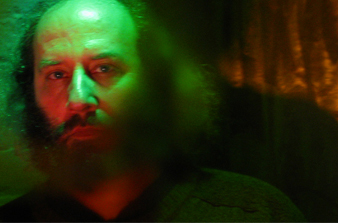 Al has been an active composer, player and distributor of experimental music since the 80s. If, Bwana is an acronym for “It’s Funny, But We Are Not Amused”. Al began when the main source of new music was cassette tapes, and his Sound of the Pig label sold thousands of pieces of music to avant listeners world-wide. Now his output is on CD and his label is Pogus Productions. The music that he makes is evocative, with layers of voices and sounds that sound like the past and the future all at the same time. You can hear some samples here. Recently, he has curated performers for The Stone in New York. He tours regularly in Europe to a very appreciative audience. You can read interviews with him by Paris Transatlantic and The Wire, two of the best journals in the world of new music. We are so fortunate to be able have him perform for us at musiXplore. There will be an opening set by ArtCrime.